The garage door is a big part of a house and is therefore very visible. If the color of the garage door does not match or is not in harmony with the color of the rest of the house, it will really reduce the beauty of the home. For this reason, it is important to choose a garage door color properly when buying it. 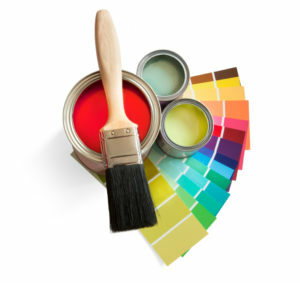 There may also come a time when a person repaints his home. So, even if he chose the right garage door color the time he bought it, he may want to repaint the garage door, too if he wants to make sure it blends with the new house color well. Color combinations may sound like they belong solely to designers and graphic artists. However, everyone has to work with colors from time to time. Knowledge in color harmony will comes in handy when it comes to choosing your garage door style and color. There are many color harmonies around but this article will tackle the three most commonly used. Complimentary colors are those colors opposite each other on the color wheel. An example for this would be a red and green combination. The colors will provide a vibrant contrast that won’t hurt the eye. Therefore, if the house is red, the garage door can be beautifully painted with any shade of green. Analogous color harmony can be achieved by choosing three colors, which are side by side in the color wheel. This color scheme usually provides viewers with a serene comforting feeling. The combination of yellow-green, yellow, and yellow-orange is an example of this color scheme. Triadic scheme is a color combination that provides good contrast. In a color wheel, a person will find this by drawing a triangle which each point in a certain color. The result is vibrant and pleasing. If this color scheme is followed, a house painted in green with an orange garage door will look very nice. No matter how well the garage door color matches the color of the house, the homeowner should still do some precautions to keep their garage doors beautiful. Dust and moisture are enemies of paint jobs. Before choosing a garage door, it is a good idea to ask a garage door company for the kind of paint used for them. Moisture and dust resistant paints are the best type of paint for garage doors. Nothing could be more beautiful than a garage door that works smoothly and without glitch. Regular maintenance from a garage door company could keep the garage door not only looking good but also functioning at its best. In addition, when the garage door starts making some noises, owners should have it repaired right away before the problem escalates. If unsure about garage door color and styles, you can always consult your garage door company, architect or interior designer. You can also never go wrong with neutral colors like off-white, gray, and brown. This entry was posted in Blog and tagged garage door color, garage door maintenance, garage door repair, garage door services. Bookmark the permalink.